in our familiar and comfortable hotel garni Wendelstein. 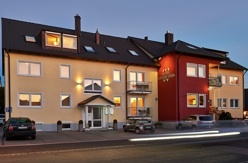 The once established guesthouse Gerner awakens after an extensive refurbishment under new management of the Hotel Wendelstein GmbH as "Hotel Garni Wendelstein". The overall concept in their newly designed Hotel Garni with proven and known address, the Südring 13 in 90530 Wendelstein offers, the overnight guest a fresh facade and a skillfully atmosphere that enriches the feel-good nature of the best. Each of the 18 rooms are separated, each with 6 single rooms, 9 doubles, 2 triples and 1 quadruple room is tastefully decorated and has a complete new bathroom with heated towel rail, hair dryer and mirror, flat-TV as a satellite TV with DVD, free Internet access with WLAN. 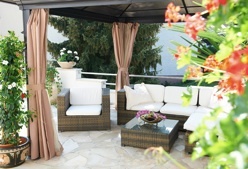 In the Holiday apartments you will find two beds and a sofa bed. Late arrivals can be used on our key safe house. We are accepting american express. We speak English! Nous parlons francais! PS: Our guests can also exercise at Jumpfitness (around the corner).